Since my childhood, I was utterly fascinated by the figure of Leonardo da Vinci and his achievements. It never ceased to puzzle and amaze me how a single person could be a scientist, mathematician, engineer, inventor, anatomist, painter, sculptor, architect, botanist, musician and writer. Fast forward many years, it was when visiting Leonardo’s exhibition in the Milan Science and Technology Museum that I decided to have him as a permanent source of inspiration for life. Being able to get in touch with his mastery of both science and arts captivated me for good. Leonardo is not only probably the greatest genius ever: he’s the one that most fully embodies the ‘Renaissance Man‘ ideal. Pursuing that ideal means being focused not on excelling on a single knowledge domain, but on having a holistic view of excellence in life. It means much more than just intellectual achievement, it means full realization of human potential in every aspect. Curiosità: An insatiably curious approach to life and an unrelenting quest for continuous learning. Dimostrazione: A commitment to test knowledge through experience, persistence, and a willingness to learn from mistakes. Sensazione: The continual refinement of the senses, especially sight, as the means to enliven experience. Sfumato: A willingness to embrace ambiguity, paradox, and uncertainty. Arte/Scienza: The development of the balance between science and art, logic and imagination. “Whole-brain” thinking. Corporalitá: The cultivation of grace, ambidexterity, fitness, and poise. Connessione: A recognition of and appreciation for the interconnectedness of all things and phenomena. Systems thinking. In the book there’s a thorough explanation of how each of these seven key areas applies in Leonardo’s life. 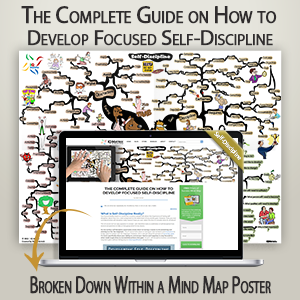 More importantly, it’s packed with practical advice and dozens of exercises you can start doing immediately to develop your thinking skills in many unconventional ways. For a reference to the exercises, check the free book summary below. Less artful, but viewable in your browser (requires only Flash Player). Full version (568 kb, requires MindManager). The online version, for download (76 kb, requires FreeMind). 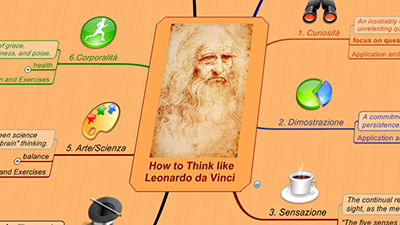 As a side note, I found it rather amusing to summarize this book using mind mapping, since How to Think like Leonardo da Vinci was one the first references I came across when learning about the technique. About a decade later, after having bought it in 1998, I still use How to Think like Leonardo da Vinci regularly as a reference for inspiration and personal growth. This book ended up becoming one of the most influential for me, solidifying my choice of Leonardo as a role model and presenting a very useful framework that I use for self-development up until today. …Which made me curious. Do you have one or more role models in life? Who inspires you the most to reach your full potential? Share in the comments!